I started Honor and Daring one year ago in response to the rapid decline of Western society and the storm that is coming our way as a result of that decline. At the time, I wasn’t very explicit about my reasons for writing. I feel the time has come to speak more plainly about the purpose of this site. Every civilization goes through similar cycles from its founding to its decline. One of the best examples of one of these cycles is ancient Rome. Roman civilization had its beginning in the 8th century. It started as a monarchy that evolved into a republic. After nearly 500 years, the Roman Republic degenerated to the point where strong, centralized leadership in the form of the Caesars became necessary. Rome flourished under the rule of Augustus Caesar that gave rise to the Roman Empire. However, even the Empire eventually decayed due to poor leadership, which in turn lead to the fall of Rome in 476 A.D.
Western democracies are no longer responsive to their constituents. Governments only answer to a small number of plutocrats who also set the agenda for the media and academia. Most voters are completely oblivious to this situation. We’ve abandoned the idea that faith, culture, and race matter. In its place, we’ve embraced the idea that all humans are fungible economic units. Everything has been reduced to a question of economics. Most children are now raised by daycare institutions, not their parents or close relatives. The economic situation makes it difficult for most couples to enable the mother to stay at home. Atheism is now the norm in Europe, and faith is quickly receding in the US. The void is being filled by consumerism and depravity. Many children now do not have the benefit of a strong father. About half of children are now born out of wedlock. More will be products of divorce. Western countries have been subject to increasing immigration from third world countries that is increasing violence while decreasing the common bonds that unite communities. And this is only the very beginning of the immigrant wave. In short, W.B. Yeats best captures our situation: “The best lack all conviction, while the worst are full of passionate intensity.” This situation cannot continue forever. Something will have to give. What form will the change take? If we are able to rid Western civilization of the corrosive influences that afflict it, the path will be relatively smooth. It will still require major surgery, but it will be closer to the transition from the Roman Republic to the Roman Empire than it is to the Fall of Rome. The West may gradually collapse with the outbreak of civil wars. This has the potential to turn into a new dark age. The governments of Western nations consolidate power and set up totalitarian police states to govern their populations in an effort to delay the collapse for several decades. The purpose of Honor and Daring is to make the first option more likely, and to help men to succeed regardless of what happens. There are groups of men that are already preparing for the inevitable transition. Some have left the degenerate modern world to form self-sufficient communities. I consider these men brothers. We are all working toward the same goal. But not all of us are able to take this drastic approach. We have to make our preparations wherever we currently find ourselves. If you fall into this category, this blog is for you. The approach I take here is a balancing act: we will stay in the world and prosper, as best as possible. At the same time, we will begin changing the culture and prepare ourselves. In other words, the goal is to not be passive, but active agents of change. 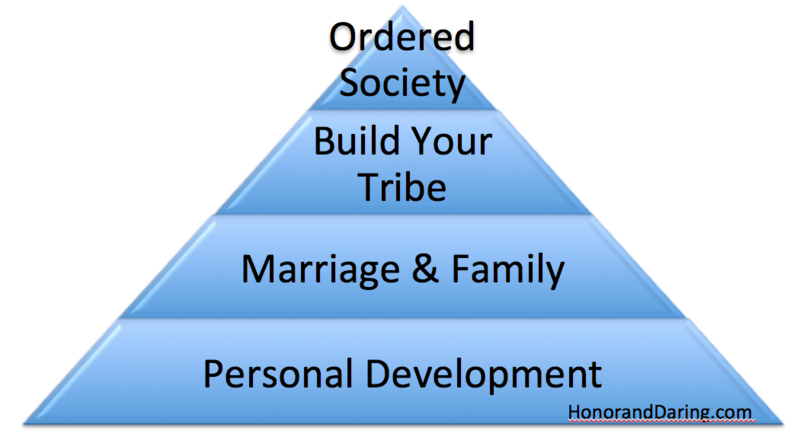 To successfully achieve this balancing act will require action on the four planes as captured in the following pyramid. 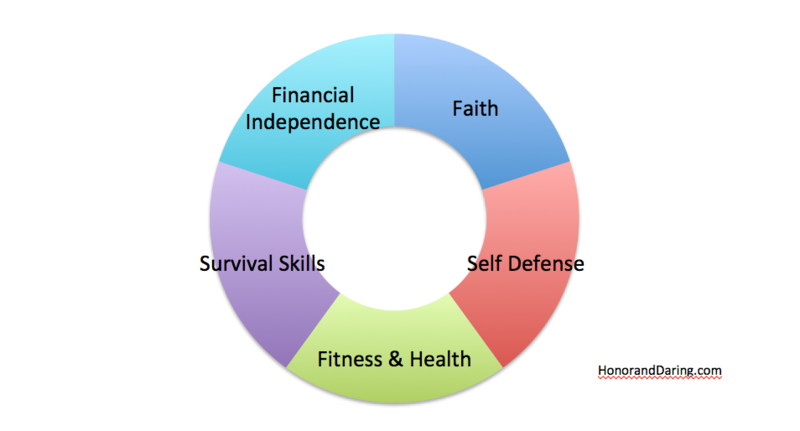 The inclusion of Survival Skills, Fitness & Health, and Self Defense is self-explanatory. These attributes are important to any man’s life, but they will become crucial if law and order begin to recede. Financial Independence may seem like an odd addition, but it is critical to rely on the system as little possible. The approach to Faith taken here will be overtly Christian. Christianity is the tradition of the West. It served as the foundation for the formation of Europe, and I believe it will be the core of a renewed society. Our motto is Christus Vincit, Christus Regnat, Christus Imperat. This blog will be largely focused on helping readers achieve these goals. While Personal Development is good, it is ultimately vain if it does not serve some higher purpose. For most men, this higher purpose will be having a wife and family. 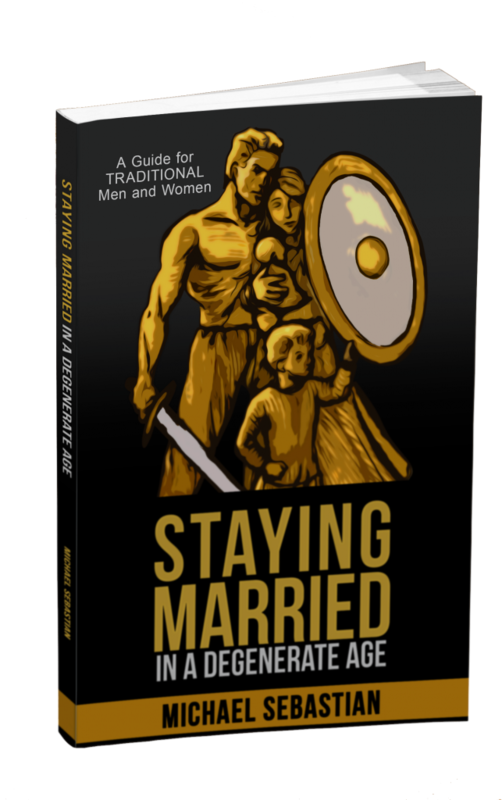 The posts will be oriented toward finding a wife, dealing with relationships, and fathering children to deal with the transition to the new age. We can’t “ride the tiger” alone. We need the support of like-minded men. The articles under this category will emphasize leadership skills and strategy. Our ultimate goal is to form a healthy society. Some believe in a passive approach—waiting for a collapse before springing into action. But I think we are quickly coming to a time when some political action will be possible. The articles related to this plane will take the form of political theory and a platform that we can work toward. There is no guarantee that any activity we engage in will be fruitful, but even in trying we’ll be able to learn things that will serve us in the future. It is an exciting time to be alive. While we lack the stability that our parents and grandparents may have enjoyed, it is our privilege to be chosen to live at this time of crisis. I hope you will join me, as I am certain that we are in for interesting times. Very well said. Another one here that is making preparations for the eventuality you articulated so well. Thank you. I just visited your blog and I can see that you have some outstanding information on preparing. I will be stopping by more often. I’m definitely doing my best while trying to see as much as I can into the future. The uncertainty makes preparation a challenge, but I pray for grace and guidance, as well as provision for the time when I am to lead. Glad you enjoyed the post. There are a lot of people coming to the same conclusions, which I think is yet more evidence that something big is on the horizon. No one person has all the answers but if we network, we’ll be organized when it hits. Thanks for the boldness of vision. I’ve already begun the process of converting to Catholicism. After having studied the Church for two years, I believe. Unfortunately, my local parish is run by a liberal nun and she is actually working against me being confirmed. Though she talks of me being in a “different place” on my “faith journey,” I suspect that my serious personality and focus on church doctrine is counter to her calls for “community” and prayers to end “racism, sexism, and bigotry” (yes, she actually prays these during during Mass. Lord have mercy). By the grace of Christ, there is an orthodox / traditional couple that has taken up my cause. A sign of the times. As a man who is physically disabled, physical fitness and self-defense are not viable options for me, but I can, and am, pursuing faith and financial independence. Thanks to the “red pill” world on the internet, the eyes are open and the cause is clear. I am happy to hear that you are on your way into the Church. I believe that we “men of the West” will gather under the banner of Christ. At the same time, it is disappointing that your parish is so corrupt. I encountered a similar difficulty while I was going through RCIA (a story I will tell at a later point). The priest who lead the program was very liberal, as were all the parishioners who were facilitating the program. Fortunately, one of my fellow catechumens was an Anglican who was also converting due to intellectual reasons. We supported each other through the process. Since then, I’ve moved and all of the parishes around us seem to be more or less sound. In the meantime, I will keep you in my prayers as I know it is not an easy situation to endure. Thank you for your prayers. I intend to persevere. Like I’ve always said, the future is looking more and more like “Escape From New York” rather than “Star Trek”. I agree, we are currently on the path to “Escape to New York.” Our mission is to prevent that future from becoming a reality. Instead, we are going to build a healthy society based on truth, beauty, and goodness. I’ll confirm what everybody else said. This was a great post. I’m sure that you know this, but “Christianity is not just the tradition of Western Culture”. It is the One True and Universal Faith, and Jesus Christ is King of Kings and Lord of Lords. Every knee will eventually bow before Him. Every culture that follows Christ will prosper. Every culture that rejects Him will fall into ruin. Of course, I whole heartedly agree with your point. Christianity has to be the center of any renewal not just because it is the tradition of the West, but because it is true. Any restoration has to align with truth. Otherwise, it is destined to fail. Contrary to those who think that Christianity will obliterate all cultures, I believe that each culture will find its fulfillment in Christ. Can I ask a question? Seems to me the worse it gets, the more supporters will flock. The bigger the injustice, the more eyes will be opened. Should we not wait for exacerbation of the situation to bring more brothers? At this point we need quality more than quantity. We need to form a nucleus of mentally and morally strong men that will prepare to lead (and actually begin leading now). There are a lot of outstanding men out there who are still working under the delusion that we have been indoctrinated into. It is good to try to wake those men up. I personally have been trying to do this in real life. Some men get it and some men don’t but I don’t worry because it is meant to be that way. I too am a Catholic and a follower of ROK. Oddly enough, I was thinking the above thought myself with regard to ROK and the self-improvement on there before I read it here. What is the aim of ROK self-improvement? To enjoy a thousand beds? Or for something more worthy? I’ve seen ROK deepening recently, with your posts and those of Aurelius Moner. I used to find the content had a slightly sophomoric air about it so I welcome these developments. With regard to your project, I have been pondering the question of leadership in the world and in the Church, and what I see is not inspiring. We have our Peronist Pope (NB I am not a sedevecantist), who I feel is not a leader at a time when the Church needs leadership. I wonder if Benedict XVI was put under pressure to retire because of his speech against Islam at Regensburg? In the “world” we have Donald Trump: although he is saying things people want to hear, I am not sure if he is the right leader. At heart he is a real estate agent rather than a statesman, which is why I only give him one or two cheers rather than the full three. In Europe, there is no leadership, and the ‘leadership’ (Merkel, Hollande, etc) are using electoral pacts to keep at bay the 20+% of people who are against Islamisation. Those 20+% are not being listened to, are being accused of being ‘far right’ and ‘Neonazis’. They’re not going to stand for being ignored much longer: I predict revolutions and civil wars in European countries. ROK has definitely taken a deeper turn since Roosh introduced neomasculinity. I feel that neomasculinity is strongly grounded in classical pagan philosophy, perhaps due to the influence of Quintus Curtius. On the Church, I wholeheartedly agree with you. The Church should serve as a bulwark for traditional men. Instead, we find it weak and infected with modernism. At Vatican II, the Church intended to christianize those elements of the Enlightenment that were true and good. The opposite happened. The Church opened itself to all of the bad aspects of the Enlightenment. Any restoration is going to have to involve the Church. As bad as thing are with the Church, the secular world is even worse. It seems that all Western governments are in the thrall of small groups (or a group) of wealthy oligarchs. 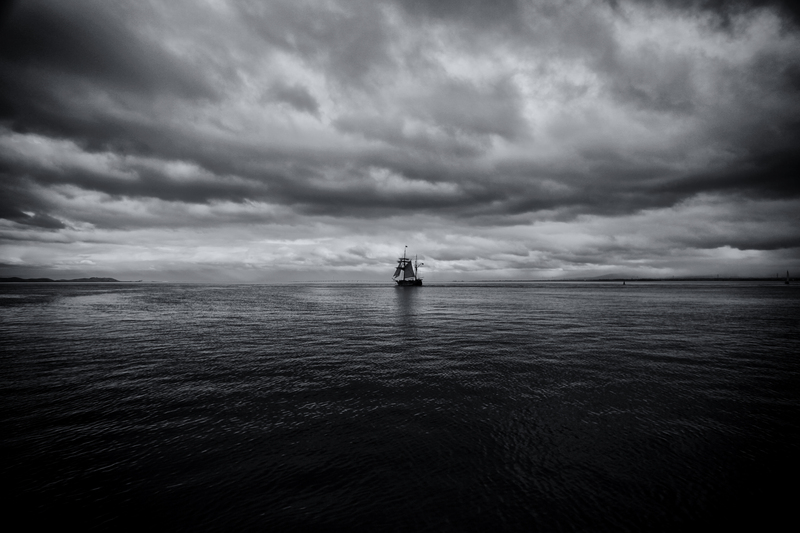 The only consolation I have to offer is that we are not here by chance. God has placed this prepared a group of souls to meet the challenge of this dark time. This is our destiny.